In the last diary entry I mentioned the problem that I was having with my hand might prevent us from leaving Chiang Mai. As I write this we are in a place called Phitsanulok, about 6 hours by (slow) train from Chiang Mai, so a little explanation is called for. I saw a couple of doctors, the second of whom was supposed to be a neurologist. Having said that, he performed almost identical tests to the first doctor I saw before coming to the conclusion that the damage was not anything to be worried about, that it was something called 'wrist drop', but also referred to as 'Saturday night syndrome' (very drunk people falling asleep in silly positions on their own arms) and 'honeymoon lover's syndrome' (falling asleep in and on the arm of your loved one). The bottom line - there is some nerve damage, but he has given me a course of tablets to take at regular stages through the day and I'll just have to keep my fingers crossed. Well, if I could cross my fingers, I would ;-) This was good enough for us to bid Chiang Mai farewell; if it turns out that the tablets and a little healing time don't work, there's nothing stopping me going to a different hospital in Bangkok. I have noticed a slight improvement though. I can straighten the hand a little more and wiggle some fingers a little more but it's nowhere near back to normal. This morning we hefted our bags into a taxi and made our way to Chiang Mai train station for the 8:30 train. The ticket cost 350 baht each (roughly £4) for a seat in the second class carriage - an air-conditioned carriage, actually. This seemed pretty reasonable, especially when we were brought a spot of free breakfast and coffee, airline meal style. Getting lunch too - a rather potent chilli-laden chicken and rice dish - was an even bigger surprise. This was value for money, alright! I can't remember British Rail ever being this good value when it was state-run and subsidised. The employees seemed to take great pride in the train - having given it a good scrub all over on the outside before we headed off, we watched someone sweep and mop the floor inside at least three times during the journey. 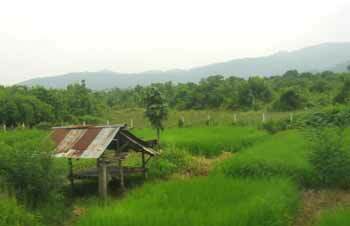 Miles and miles of green, rice paddy fields and who knows how many mosquitoes waiting for fresh blood? I wandered off down the road trying to find the hotel that we'd pinned our hopes on, based on the Lonely Planet descriptions. It was called Asia Hotel but not to the locals, it seemed. I was asking about to see if anyone could help locate it. Even though I had a map with the location marked on it, I discovered that this was not an easy task when every other shop and sign was in Thai. I could not see another sign in Roman letters that would help me cross-reference, but eventually I found the place, checked in, then came back to the station to collect Manda. Phitsanulok very quickly gave me the impression of being a town that was not used to catering to westerners. 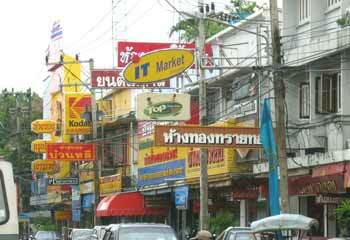 In fact, it was about as different from Chiang Mai as we could possibly have imagined. Very few spoke or understood even the most basic English phrases, even in the hotels. I had a particularly difficult time trying to ascertain how much our hotel would charge for laundry. I managed to work out that 1 = 10 baht. So, is that 1kg of laundry for 10 baht? After another minute I realised that the girl at the counter was trying to tell me that it was 10 baht to wash each item. I then began drawing pictures of different items of clothing (picture of T-Shirt = 10, picture of trousers = 10) to clarify. But did that price include ironing? Or was that just for washing? Oh heck, out with the phrase book again. I found the Thai words for 'including' and 'iron, to' but still couldn't understand if that was included in the price. Out came doodle pad again (picture of shirt + picture of an iron = 10?). In the end, I gave up trying - I can manage until Bangkok! There were very few signs in the street that were recognisable to these Western eyes. Walking down a street to look for a shop, it was impossible to go by the signs alone - I had to walk past each shop and look in, see if I could recognise what kind of business they were in. If there weren't many tourists, who were the local shops selling to? It seemed that in the area near the train station, every fifth shop was a jewellry shop, staffed primarily by bored-looking 'attendants'. This town just didn't strike me as very affluent. There were also no Internet Cafés at all. No biggie, we could wait (although I did want to do a follow-up post just to let people know that my hand hadn't fallen off or anything!). Phitsanulok also seemed to have more dogs wandering the streets than Chiang Mai, most of them apparently very interested in the sight of a pale pair of legs walking past that seemed to shout 'foreign cuisine'. More than a few times, as I recce'd the area, I found myself trying to decipher the looks I was getting from these possibly rabid hounds! The strange thing about seeing so many dogs on the streets is this - where are all the dog poos? In just a short weekend in Paris, I found myself continually having to avoid 'dog eggs' in main shopping streets, although I wasn't always successful at that. Here, though, it doesn't seem to be a problem. My friend, Nick, has a theory (or is it fact?). I mentioned to him that I thought it was funny how, whenever you order a soft drink here in Thailand at a shop, you are automatically given a straw or two and a little plastic bag. In these days of high oil prices and a more conservation-aware society, the frivolous handing out of plastic bags surprised me (oil is used to make all plastic items, and many Asian companies producing cheap plastic goods have found it hard to make a profit with the rising cost of raw materials). But every time I get a coke, I get a straw and a plastic bag. Sometimes, you'll get a plastic bag full of ice too, and that, along with the coke and the straw gets put in another plastic bag! Nick's theory? The plastic bags are being handed out so generously to encourage people to clean up after the strays. Now, if only we could get Parisians to adopt this idea.